Amazon reported strong earnings. But its stock fell in after-hours trading as investors focused on slightly weaker-than-expected sales and a relatively dour forecast for the all-important holiday quarter. Amazon notched its fourth quarter in a row of billion-dollar profit, surpassing analysts’ expectations amid fast growth in the company’s cloud-computing and advertising businesses. But Amazon’s forecasts for its financial performance in coming months were weaker than analysts expected, sending shares lower Thursday as investors worried that the company might falter during the all-important holiday quarter. The Seattle company posted record net income of $2.9 billion during the three months ended Sept. 30, up from $256 million a year earlier. Famous for putting most of its profit back to work into expanding other areas of its business, Amazon in recent quarters has started to reap the rewards of big bets in lucrative areas including rented computer power and software services and, more recently, advertising. Amazon Web Services, the company’s most profitable group and the leader in the nascent cloud-computing market, posted $6.7 billion in sales during the quarter, up 46 percent. Sales attributed to the company’s “other” category, primarily advertising, more than doubled, to $2.5 billion. Even as many of those businesses fire on all cylinders, the institutionally frugal company says it is cutting back. 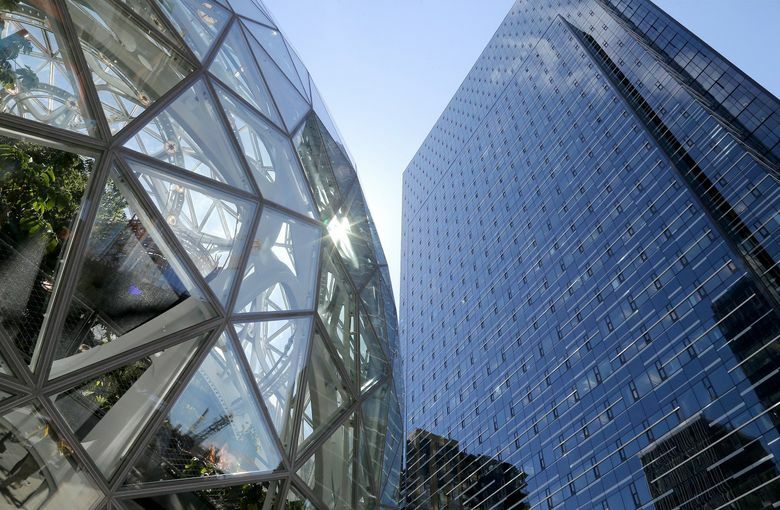 Amazon this year has slowed the growth of spending on projects from new warehouses and data centers to hiring at its Seattle headquarters, limiting new hires in departments outside of major investment areas like Alexa software and Amazon Web Services. “We’ve been able to cut back in a number of key areas,” Chief Financial Officer Brian Oslavsky said on a conference call with reporters. The promise of disciplined investment, however, wasn’t enough to take investors’ eyes off slightly weaker-than-expected sales and a relatively dour forecast for the holiday quarter. Amazon shares, which surged 7.1 percent during regular trading Thursday amid a market rebound of battered technology stocks, fell 7.7 percent in after-hours trading, to $1,645.10. Revenue during the quarter was $56.6 billion, up from $43.7 billion a year earlier but short of analysts’ forecast of $57.1 billion. Meanwhile, Amazon said it expects sales during the last three months of the year to land between $66.5 billion and $72.5 billion. That’s less than some analysts were anticipating. A result at the low end of that range would be the smallest sales growth at Amazon in years. Asked on conference calls with reporters and analysts what was driving the anticipated slowdown in growth, Olsavsky, demurred, saying the company tended to plan for a wide range of outcomes during the holiday season, and that the then-new addition of Whole Foods Market stores inflated revenue figures during the same period in 2017. Amazon’s projections for the rest of the year include the impact of a new $15 minimum wage taking effect next month for some 250,000 hourly customer service and logistics employees in the U.S., but Olsavsky didn’t break out the cost of that move. The company earlier this month announced the new wage floor, and the removal of some stock awards and bonuses, after years of criticism of its pay practices and working conditions inside its warehouses. Analysts with Jefferies, an investment bank, estimated this week that the higher minimum wage would cost Amazon $415 million in 2018, and $1.5 billion next year. The recently completed quarter included Amazon’s Prime Day, a shopping holiday the company invented in 2015 to boost sales during the slow summer months. This year’s event, which began on July 16, brought the biggest 36-hour sales period in Amazon’s history, despite glitches that prevented some interested shoppers from reaching the company’s retail websites. Sales in Amazon’s North America retail segment came in at $34.3 billion, up 35 percent. Operating income in the segment surged to $2 billion, from $112 million a year earlier. Internationally, Amazon’s operations continue to lose money, the result of heavy investment in India and other markets. Amazon in September launched a flagship retail site in Turkey, joining 13 other markets outside of the U.S. that have a dedicated sales portal. The company’s international group posted operating losses of $385 million, on sales of $15.5 billion. On a per share basis, the retail and technology giant reported net income of $5.75, up from 52 cents a share in 2017. Analysts surveyed by Thomson Reuters had forecast profit of $3.14 a share.